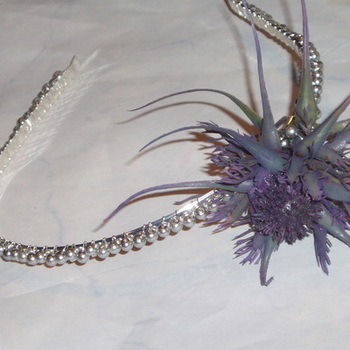 Really stylish and oh so Scottish, Thistle headband, on a silver plated band. Handmade using an artificial Thistle so it can be worn again. The headband is wrapped with 4mm glass pearls in white, silver, green or purple to match thistle colour. Just choose the colour you want. Perfect for day or evening wear, Wedding, Bridal or Prom.